BX-4 McKinley HD 10x42mm Binocular. Illustration courtesy of Leupold & Stevens. "The new BX®-4 McKinley™ HD binocular will not only change the way you see game, it changes the game completely. The HD lenses provide amazing optical returns to deliver the most vivid colors and sharpest picture you can find, with a full flat field of view, across the entire visual field. Add in Leupold’s legendary rugged dependability and you may never need another pair of binoculars. The closer you look, the more you’ll see." That is Leupold's (www.leupold.com) introductory statement about their new BX-4 McKinley binocular line. Bold words. However, hundreds of hours of design and testing at Leupold's state-of-the-art Beaverton, Oregon USA facility went into these binoculars before overseas production commenced. · Close focus distance: 8.2 ft. Especially notable is the HD lens system. This features extra low dispersion objective lenses and rare earth coated ocular lenses to enhance both sharpness and color fidelity under all lighting conditions. The long eye relief benefits eyeglass wearers and the twist-up eye cups benefit everyone. For this review, Leupold sent me the 10x42mm model. Inside the attractive Leupold box I found a concise, but informational, Leupold Binocular Guide, wide carrying strap, lens cleaning cloth and a high quality nylon binocular case. Inside of the latter was nestled the BX-4 McKinley 10x42 binocular, its optics protected by removable ocular caps and attached/removable, flip-open, rubber objective caps. Immediately upon removing the binocular from the case, it was apparent that I was holding a solid optic. The extra strong, machined magnesium alloy body, tactile rubber armor and smooth adjustments made this abundantly clear. 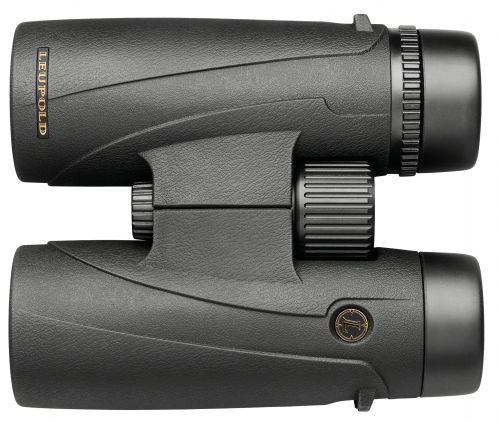 The comfortable thumb grooves, fast center focus, equally smooth (but intentionally higher effort to prevent inadvertent movement) right ocular focus and three position, twist-up eye cups indicate that the Leupold designers put serious thought into the ergonomics of this binocular. The BX-4 McKinley binocular has the look and feel of a top-line Japanese or European binocular, so I was surprised to discover it was made in Red China. Of course, I know the Chinese are capable of producing high grade optics. For example, the excellent Celestron C6 astronomical telescope, manufactured by Synta Optical, which received a very favorable review by Astronomy and Photography Online. To produce the McKinley series binoculars at a reasonable price, Leupold has an exclusive partnership agreement with their Chinese manufacturer. These binoculars are engineered and manufactured to standards set, monitored and controlled by Leupold & Stevens. They are warranted for as long as the original purchaser owns them against defects in materials and workmanship and to function satisfactorily under normal use conditions. This Leupold Lifetime Warranty differs from the Leupold Full Lifetime Guarantee on their Gold Ring scopes, because it is not transferable and does require online registration to activate. Leupold's excellent customer service is renowned and serves as the benchmark for the entire optics industry. The biggest problem when viewing with any 10 power binocular is holding it steady, since the binocular magnifies user movement the same amount as it magnifies the image. The manufacturers know that virtually all of their customers will hold 10 power binoculars by hand, so this is how they are designed to be used. The Leupold McKinleys do have a ¼"x20 tripod mount under the cap at the front of the center hinge that, by means of an "L" bracket, allows mounting the binocular to a camera tripod. However, I would wager that not 1 in 1000 buyers even know it is there, let alone ever use it. In my case, I have a tripod mount for giant binoculars, but not for standard types. Therefore, I did my critical observing with the 10x42 McKinley hand held, with my elbows firmly braced on a solid surface. For most of us, that is as steady as it is going to get. The first things you will notice when you look through this binocular is its razor sharpness, contrast, color fidelity and edge to edge flat field. The latter is especially notable, as these Leupold McKinleys offer superior performance in this regard. The flat field will be especially obvious to amateur astronomers searching star fields, who will appreciate seeing pinpoint stars across the entire field of view. Hunters, bird watchers and other outdoor enthusiasts will find spotting elusive prey in the field easier with these binoculars, due to their high contrast, excellent resolution and edge sharpness. Inspection revealed that the insides of the main tubes are comprehensively blackened. There are grooves inside the ocular bell to break-up stray light. Threaded retaining rings secure the objective lens elements in the one-piece main tubes. Viewed from behind, the exit pupils are nice and round, indicating adequately large prisms. These are all practical indications of high quality construction. The McKinley has the kind of visual snap that characterizes premium optics. Collimation is perfect. Lens flare and internal reflections are very well suppressed when viewing against a brightly lit background. Light sources at night are rendered cleanly. Colors are saturated and accurate. Visual sharpness (a combination of resolution and contrast) is excellent. Optical aberrations and distortion are well controlled, areas in which most binoculars are found wanting. The bottom line is that the BX-4 McKinley 10x42mm binocular provided excellent views of all subjects in all lighting conditions. It is a very high quality binocular, both optically and mechanically. The BX-4 McKinley is a relatively expensive binocular. However, its performance challenges some of the considerably more expensive binoculars from top European manufacturers, such as Carl Zeiss, Swarovski and Steiner. Seen in that context, Leupold BX-4 McKinley binoculars are a real bargain.